Customers Kristian and Leanne decided to break from tradition and chose an alternative Wedding theme, despite initial protests from friends and family. These Brits picked the American Old West and went all in. 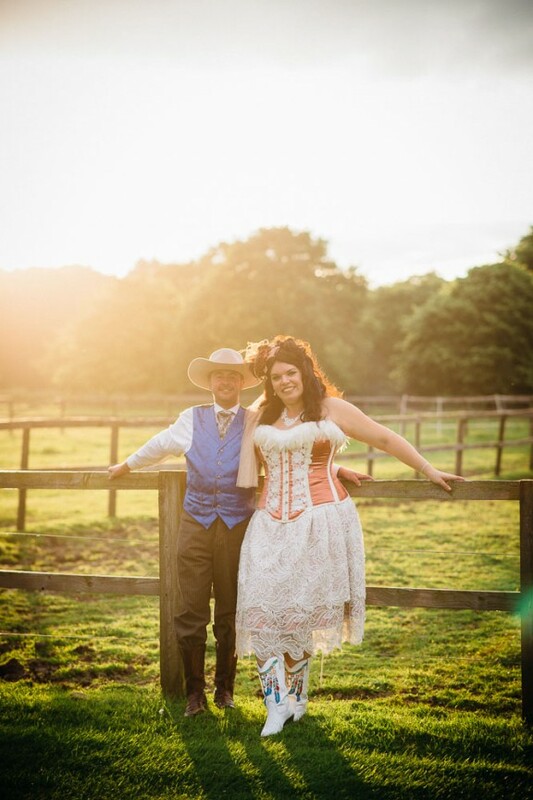 As we always like to go against the norm, my wife and I, organized a Cowboy themed Wedding. We wanted our big day to be a fun filled party for all of our family and friends rather than a structured formal affair. 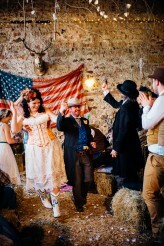 We got married in an authentic barn on an estate in Yorkshire, England, complete with wagon wheels, rodeo bull, US flags and hay bales in front of over 100 cowboys and cowgirls. One of the highlights of the day (apart of course from marrying the love of my life!) was my arrival to the barn. I arrived in a classic 1966 Ford Mustang and I was dressed head to toe as a Western Sheriff! Online Wedding Planner Blog Rock N Roll Bride featured this couple’s western nuptials earlier this month. Be sure to check out the article and all the photos here. Do you or someone you know have a wedding story or photos featuring our clothing, then please contact us! ← Stop Wondering What to Wear… Get Fabulous Halloween Outfits!